Our sweet, spacious house and guest house is a unique compound, secluded yet accessible. Tucked under the trees on a hill surrounded by 1 1/2 wooded acres, it is perfect for families who want to be together, yet have privacy. The houses were originally built by a Vineyard artisan. 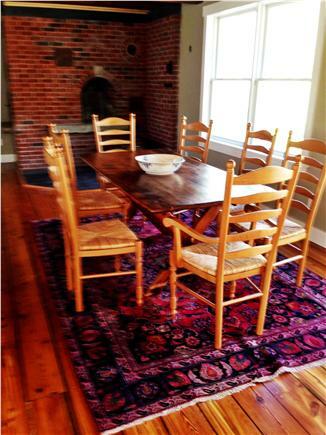 We restored it several years ago with respect for the home's character - sophisticated but relaxed. The main house's gourmet kitchen is fully equipped with a Wolf range top and double wall ovens, soapstone counters and an old farmhouse sink. 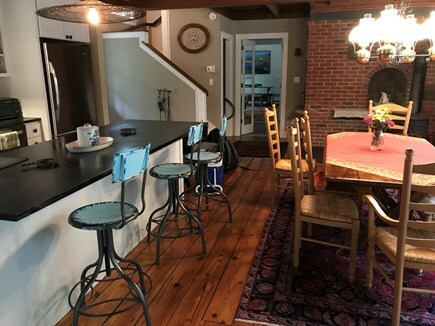 It is an open space with the dining area set beside the unusually large brick hearth, which was built by an Island mason (and blues musician) who returned to the house to restore it. 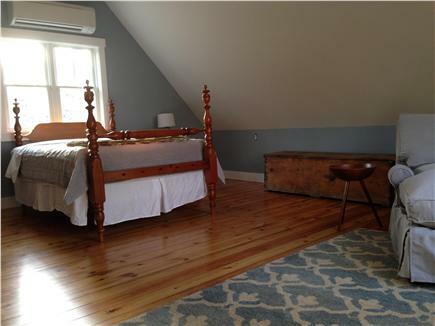 The room also features beautiful, historic, reclaimed exposed beams and wide-plank pine floors. Down the hall, past the laundry room is the large family room, furnished with new, down-cushioned couches and equipped with a wide-screen HD cable tv, good books and board games. 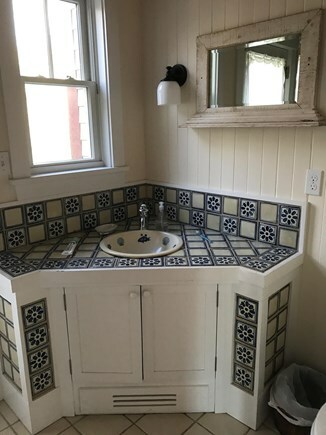 There are two full baths, with hand-made Mexican tiles, french doors in front and back leading to mahogany decks overlooking the gardens, and a large master bedroom with hand-turned antique queen bed and a chaise by the window for reading and napping. 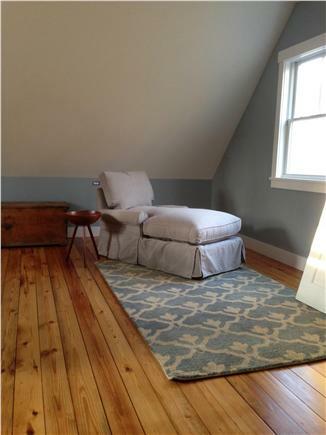 Two smaller bedrooms, one with an exposed brick wall, and a quiet office space are down the hall. Across the yard, the guest house is an enormous, Soho loft-like space with a post and beam cathedral ceiling and skylights, bathing the house in natural sun and moon light. 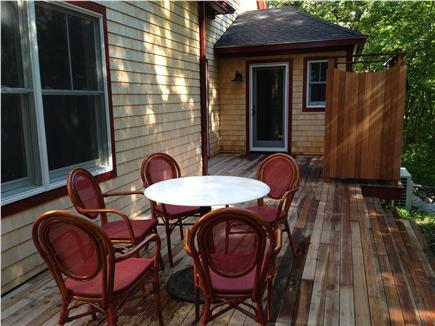 There is a breakfast nook, a living area with two sets of French doors opening to the deck and woods. 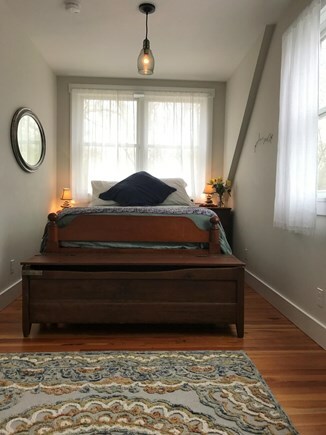 Off to one side is a sleeping alcove with an antique four-poster queen bed and on the other side, a luxurious full bath with skylights, a copper soaking tub and separate walk-in shower. We are a short walking distance to the calm waters and long sandy shores of Lambert's Cove beach and only a few minutes to Uncle Seth's Pond where kids can hunt for tadpoles and swim in shallow water while adults can go for a nice long swim. 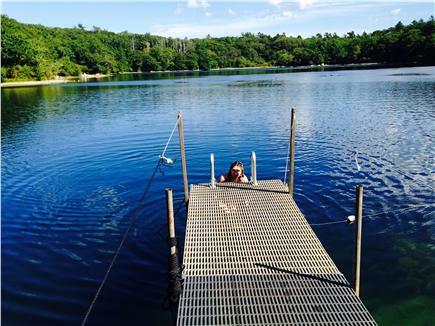 Our houses are also a five-minute walk to Ice House Pond, which is one of the best (and semi-secret) swimming spots on the Island. By bike or car, you can pop down to the Black Dog restaurant and bakery for triple berry muffins, lobster rolls and superb clam chowder. Cronig's supermarket, and the quaint town of Vineyard Haven are only a few miles away. Both houses have outdoor showers. Note: cleaning fee is pro-rated. Additional availability info: rental for multiple winter months will be discounted. This is a Saturday to Saturday vacation rental. Additional pricing info: cleaning fee is an optional flat fee of $275 or pro-rated, State and local taxes of 5.7% will apply. My parents, their golden retriever, my two children, my husband and I spent an amazing week here in August of 2018. 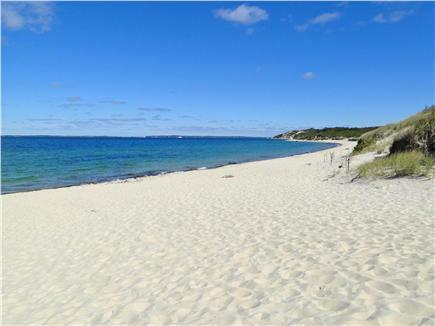 The home is stunning - comfortable, immaculate, well-appointed, quiet, and spacious - and is in a perfect location on Martha's Vineyard for those looking for a relaxing spot on the island that lets you take advantage of its beauty. We were able to walk the kids and dog to Lambert's Cove in the morning (one of the few places on the island where dogs can be on the beach in the summer) and return later in the day to hunt for gentle watermelon jellyfish and float on the calm waters, walk to Ice Pond and Seth's Pond (my kids' favorite), and jump in the car for quick drives to mini-golf and ice cream when we wanted a little more excitement. Always a pleasure to have you! Looking forward to your return! 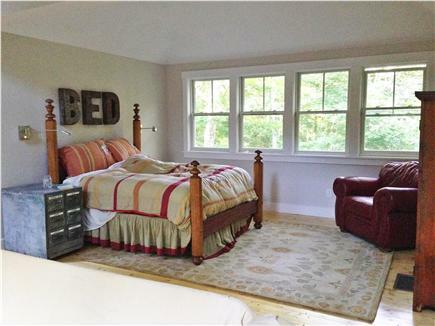 This home was spacious, comfortable and beautifully renovated and decorated. Having the guest house for extra visitors was ideal for our extended family and made it into a wonderful reunion spot for cousins and siblings to convene. The owners were lovely and made sure we were comfortable. We plan to come back next year! What a beautiful home! Melissa and her family were very welcoming upon our first visit to see the house in early June. 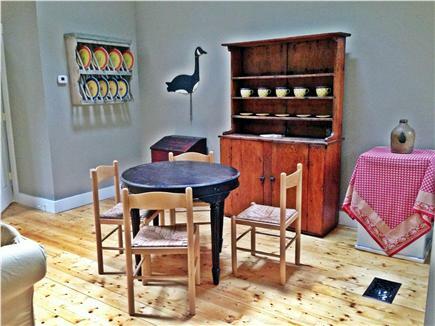 We immediately fell in love with the home and all the wonderfully decorated rooms. Our family of 4 and our extended family stayed for a lovely week of relaxation and fun. Lots of room and places for everyone to gather. Absolutely recommend it for anyone looking for a great home, away from the shops and yet a close drive to visit them. 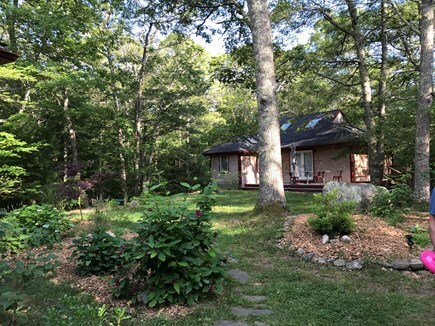 Tucked in a tranquil wooded area just a short walk from one of the best beaches in Massachusetts, this home with its spacious rooms, family-friendly layout with room to spare will not disappoint. Every detail has been carefully designed both aesthetically and for your comfort. This is not merely a rental property, it feels like home. Thank you, Linda! We are so glad you enjoyed your vacation. Looking forward to having you return some time soon! 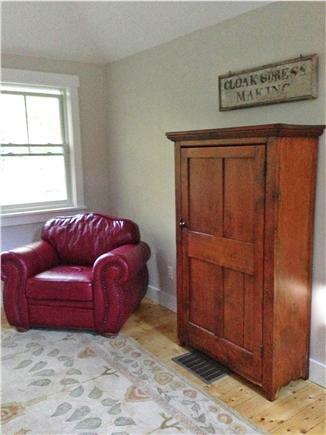 Beautifully restored home in a great location - walking distance to Ice House Pond. 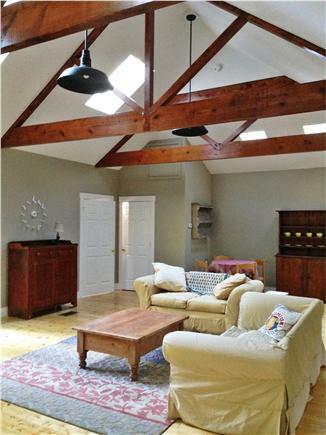 Fabulous kitchen and lovely dining space with large living room and separate sitting area. 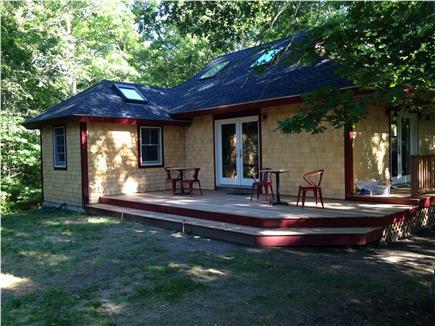 Bonus is the cabin located on the property with its own porch and lovely en suite bath. Highly recommend. Beautiful house in a special place! This is an enchanting place, designed with great attention to detail. It is lovingly maintained and fully equipped with all you need for a relaxing and comfortable stay. The laundry area (located on the first floor), wifi, and beautifully equipped kitchen help make the house feel like home. 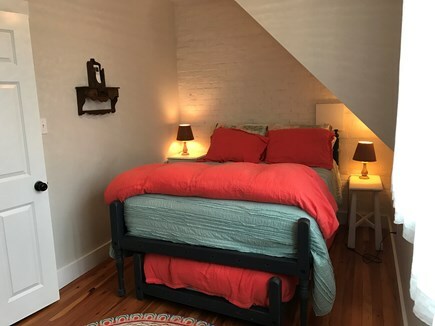 The wonderfully airy guesthouse offers space and privacy, creating a small compound with room for everyone. It is great for extended family, visiting friends, or older kids who like time alone to relax, play games, listen to music, etc. 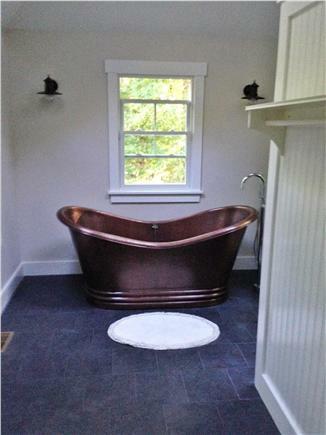 There are outdoor showers, deck and lawn areas, and even a soaking tub! 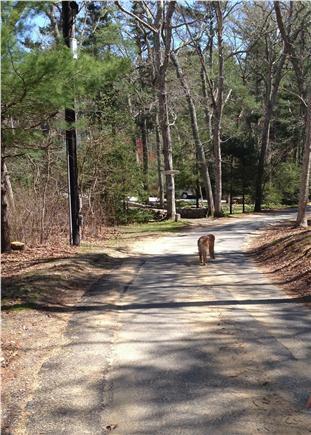 West Tisbury is our favorite part of the Island, accessible to everything, yet private and pastoral. Lambert's Cove Beach is spectacular both in-season and off-season. This house in one word is "Beautiful!" There is more than enough room for a family and a few friends to stay on the property comfortably. The bedrooms in the main house are lovely and are air conditioned ( not that you would need to use it often). 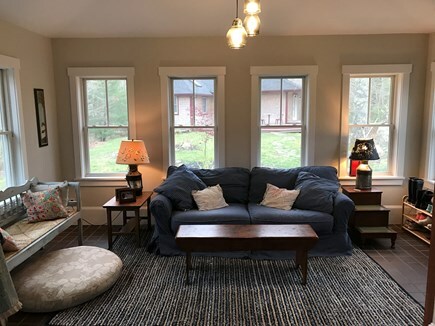 The pictures on this website do not do the house justice. Every detail of this house was prepared with love. The owners left plenty of instructions and contact information in case anything unexpected happened. Our party stayed for a week and some still had "office work" to do so the fact that the house had wi-fi was an added bonus. There are plenty of pots, pans, glasses, dishes and eating utensils. All the appliances are new, even the washer/ dryer which by the way is conveniently located on the first floor. 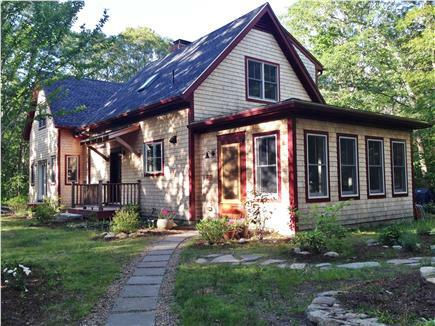 Great location for beautifully refurbished guest homes, perfect for extended family…like new! We received a warm greeting from the owners upon our arrival and a tour of the newly restored homes that included a 2nd guest house. The home was redone in all highend furnishings, reburbished & new flooring, new stainless steel appliances, plenty of plates, glasses, even fine silver for everyday use. 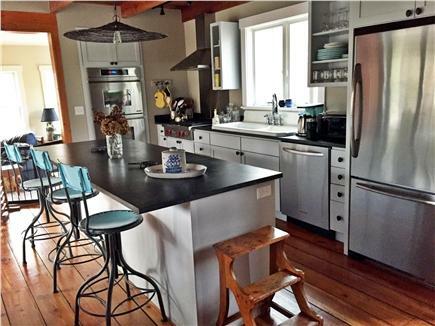 Also plenty of pots & pans to cook, bake or fry in, a coffee maker along with a new Weber grill, washer & dryer. There were cleaning/laundry supplies, spices and storage containers/bags for leftovers and a water dispenser w/ filter. It was nice to have supplies available and not have to start from scratch to equip a house with every little item for just one week, so thank you for that :). The baths had plenty of towels and the bedrooms plenty of sheets, pillow & blankets. Appreciated the pack n play and highchair for our grandchildren.